Solutions to Lengthen the Flat Spot. Part 1. 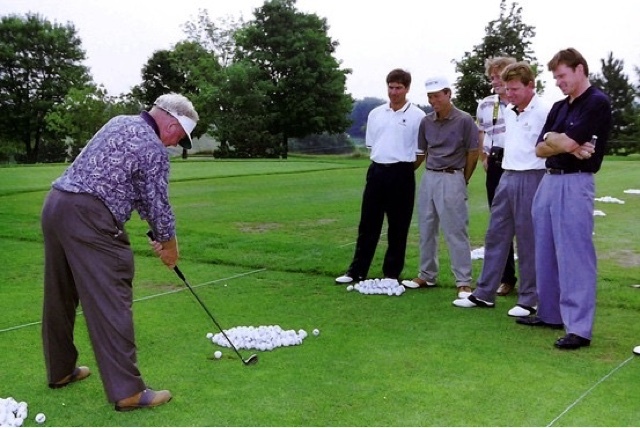 What can we Learn from Moe Norman ? Let us start to propose some solutions that help to make the lengthening of the flat spot automatically using the properties of our human organism. 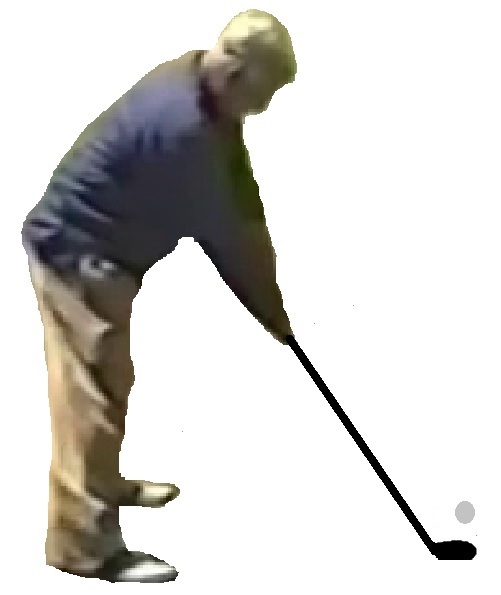 Sadly, golf instruction do not deal with automatism -- perhaps theorists do not believe in that (as the action of human organism contains so many variables that it cannot be automated), perhaps they believe in muscle memory and repetitions, who knows. The truth is that although it is very difficult to find proper automating solutions -- they exist. Sometimes it is just a good brilliant idea that suddenly comes to mind, sometimes it is a hard work dedicated to observe the best ballstrikers that ever lived. This part one of the series is just a perfect example of the latter cases. 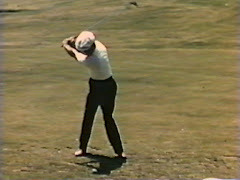 Moe Norman, a savage genius, whose legendary ballstriking is compared only to Ben Hogan. Tiger Woods said Moe and Hogan were the only one golfers who owned their swings. What does that mean ? To me it always sounded like a praise for automatism in their swings. Not coincidentally the key word of Hogan's best book "Five Lessons"is automatism (please revert for the details to the article named 'Mr.Hogan's Contribution to the Idea of Automating the Motion' here on our site). 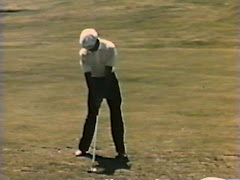 On the other hand, Moe Norman ironically said after nth ideally copied shots "Why is this game so easy ?" We sincerely believe it is so easy because of serious automatism introduced into their swings, no doubt, supported with lots of training hours in both their cases. 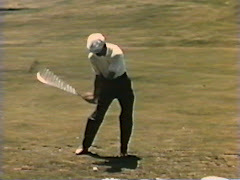 We sacrificed lots of articles and vids to Ben Hogan in the past, time for the other genius ballstriker. What can we learn from Moe Norman then ? 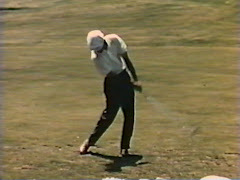 If you ask golf theorists why Moe was so great a ballstriker they would corcodantly say because of his single plane; of course, this is not true as Moe was not swinging at single plane (he was a double shifter who used to stay away from the ball with extended arms). Some others would say his wide stance contributed to this; we say not all people who perform wide stance at address are excellent balstrikers. 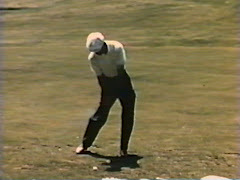 Lastly, some says that "his feet remained planted, keeping the foundation and trajectory of the flight true" (both this quote as well as the above GIF taken from one of GolfDigest articles : https://www.golfdigest.com/story/what-you-can-learn-from-moe-no); this we find true, however, not as the cause, but the effect of what we are describing below. What can we see there ? 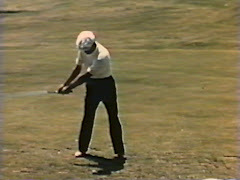 Placing the clubhead behind the ball -- an inch in case of irons, several inches in case of driver -- because of the fact that this is exactly where we want the flat spot to begin; in order to hit the teed ball on the upswing the flat spot must start earlier and end earlier. The whole procedure sort of presets the appearance of the flat spot in the impact zone as well as give signals to our subconscious mind to flatten the whole swing while approaching the impact zone. One can also subconsciously friendly hit at the ball (instead through it against ones subconscious mind) without losing swing speed prematurely. Last but not least, it gives more room for inevitable CoM shift to the lead leg without necessity of rapid increasement of the (secondary) axis tilt which can lead to inconsistencies. 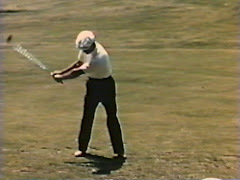 With all this it is very natural to swing with 'quiet feet' planted firmly on the ground even long after separation. 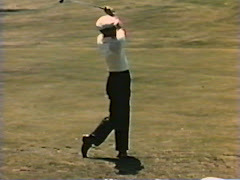 Also the distance between the clubface and the ball helps to set the correct path and clubhead angle for us. 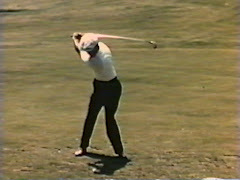 If the clubface is directly behind the ball our eyes cannot recognize ideal clubhead path and transfer it to out mind. We do not know that this was also Moe's intention (as he was incredibly straight hitter) but this seems so logical a consequence of Moe's set-up that it would be silly not to mention it. 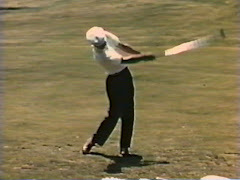 It is also worth noticing that for a neutral stock shot the clubhead (that lies behind the ball) should be placed according to the swing arc and not having its sweetspot in line with the ball -- slighty withdrawn with irons, much more with the driver (toe in line with the ball -- see the exaggerated image above).